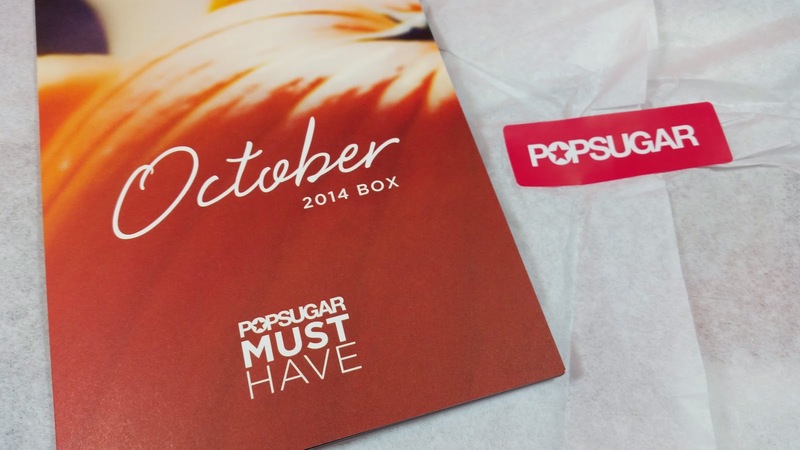 Popsugar Must Have October 2014 Review + $10 Off Coupon Code! Popsugar Must Have is one of the best all-around subscription boxes out there. It is curated by Lisa Sugar from Popsugar.com and always has an interesting array of products in it. It's also one of my most favorite non-beauty boxes. It's a lot of fun, too! This month got off to a rough start. Popsugar redid their website and when it came back online it was riddled with bugs. There was an entire week where no one could even make an order, then people were being charged when they had cancelled, all records of past boxes/subscriptions/orders, etc. had all been lost. I don't know what went down but I'm betting someone's head hit the chopping block over this debacle. I ended up being double charged and had to contact them. Two days later, the charge was refunded with absolutely no questions. They really do have excellent customer service but I think with all the problems, CS is on overload. Luckily for all of us, this, too, shall pass and we will be back to our regular deliveries of Popsugar goodness. Isaac Jacobs International Acrylic Frame- This is clear on both sides and connects with magnets. If you like that minimalist look, this is for you! It's not really my style but I'm sure I can find a place for it. Who doesn't need a picture frame? Although, if this is really $36, I might croak. (Oh, wow. It really is! I've never even heard of this guy. And really... it's two pieces of plastic and some magnets...) Useful, though! 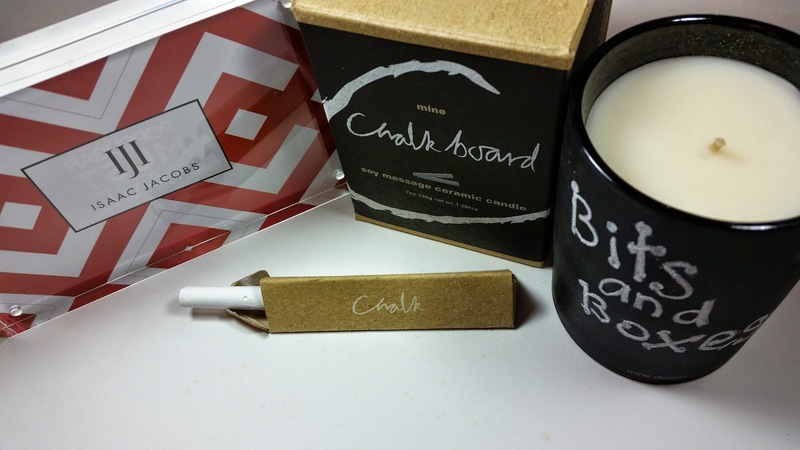 Mine Chalkboard Soy Message Ceramic Candle in Pomegranate- It's a chalkboard candle! I put my chalk to use already, too. :) I enjoy having candles around. This one smells very fruity and is quite strong. I smelled it before I even opened the box. I think I'll put it in a bigger room so the scent can dissipate to reasonable levels. I will say that once you write on it, you shouldn't touch it since it's super easy to smudge. 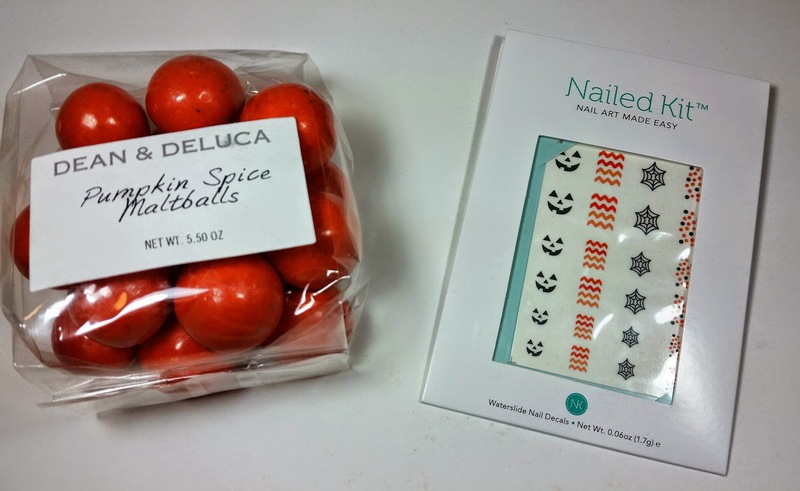 Dean and Deluca Pumpkin Spice Maltballs- So, I had a bad experience with malted milk balls when I was... Oh, probably 12. My Nana had got me a 5lb bucket of Whoppers for my birthday. My birthday is in August so it's pretty warm and we were at a park. Well, I didn't want them to all melt (they did start melting and clumping together) so I ate a large quantity. Which really didn't put a dent in a 5lb bucket... Then I put it in the car. When we had to drive home, not only was I sick from all the Whoppers I had eaten but the car smelled nauseating like malt balls all the way home. One hour of feeling nauseous and smelling the overpowering scent of malt immediately got rid of any love I had for malt balls. Nailed Kit Halloween Decals- These were made especially for Popsugar to help us all get into the Halloween spirit. I like it when a box pays attention to the holidays and includes a little something to commemorate it. These are like tattoos for your nails. Stick, water, rub, apply clear coat and done! K. Hall Designs Shoreline Shea Butter/Olive Oil Bar Soap- This is an extra! That means it doesn't count toward the value of the box and is usually sponsored (this time it's Progresso, which I totally don't get the connection but whatever!). This has a light, neutral scent and will definitely be used. It's hard to get back into soapmaking when I get so much fun soap in boxes. Still, Christmas is coming and I need to get on it! 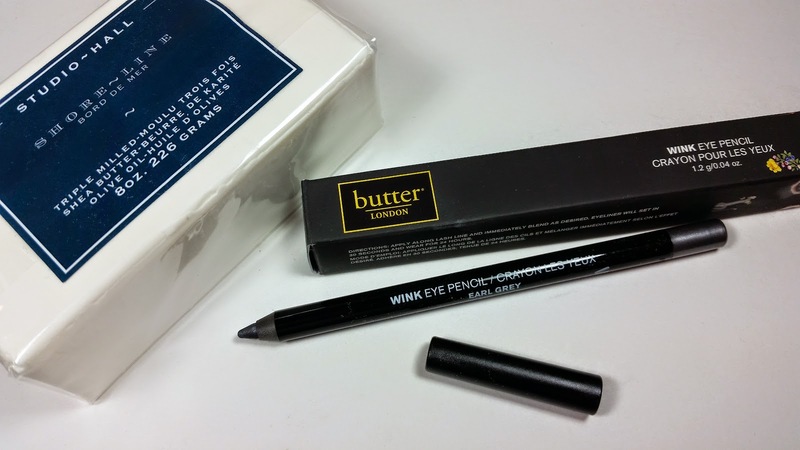 Butter London Wink Eye Pencil in Earl Grey- I *love* these butter London eye pencils! They go on like, well... butter. Smooth gliding and with great pigmentation. This is a gray but it's also sparkly/shimmery. It's very pretty, it's a brand and formulation I love but I just won't use the color. This will make someone else happy, though. Happy Socks Combed Cotton Socks- Speaking of happiness! Socks make me happy! I love socks and its a big joke with my husband. Every Christmas, he gets me a stocking full of socks. I get socks for my birthday and socks for Valentines day. I have some pretty awesome socks but I don't have any like these. While this isn't my favorite pattern, they're still fun and I'm happy to add them to my collection. BJB Express $40 off your Express Jeans Box- I never count coupons toward the value of the box unless it's for something free. This is not free. This is an expensive service that sends you outfits of expensive clothing. Well, expensive based on my research- $50-$500. You pay for what you keep, lose the "styling fee" if you don't buy anything. That type of thing. So, not interested. Luckily, this is also considered a freebie and isn't counted toward the box. VERDICT: Another fun Popsugar MustHave box, in my opinion. You really never know what you are going to get. The value is *always* there with this box. At first I wasn't sure about the box but now that I have it, I'm thinking of all the ways to put thing things inside to good use. Even if I can't/won't eat the malt balls, they'll look good in a dish and others can eat them. The socks are an automatic love just because they're socks. The candle will absolutely get used and I'm going to repurpose the chalkboard glass when it's gone. I just took off my nail polish so that I can use the Halloween Nailed Kit. I'm excited about what might be in next month's box now. If you sign up now, you will likely get this same box! If you would like to sign up for Popsugar Must Have, you can do that right here! Make sure once you sign up that you fill out your Preference profile, too. One of the previous boxes sent earrings to those who preferred them and necklaces to those that didn't so it does count for something. If you do sign up, make SURE you use the code GWP10!! It will give you $10 off AND a Kendra Scott Cat Eye necklace! This is courtesy of MSA and (I'm assuming) is to help mitigate the sadness of what's happened with late boxes this month. You will draw birds on yours, of course!